The Unit system built from standardized components, either in Steel or Aluminium alloy. The Unit System provides three point dual sensitive lap/diagonal seat-belts for each occupant, within the seating system. The Unit system mounts directly to the VEHICLE CHASSIS RAIL FLANGES without need for any ‘Overfloor Mounting system’. The Unit system can easily be adapted to any make of van, and installed by anyone who can install bolts and nuts. 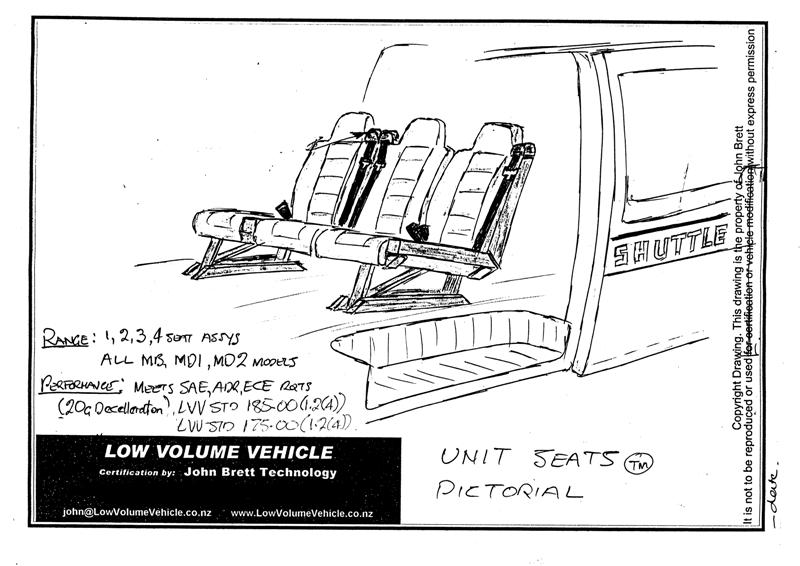 The Unit system meets ADR seat and seatbelt sytandards, and LVV Seat Std 185-00 Clause 1.2(4), and LVV Seatbelt Std 175.00 Clause 1.2(4). The Unit system has never been presented to the LVVTA for approval.